How did it get to be March already? Spring–and Passover–will be here before we know it! Once again, Congregation Aitz Chaim will be hosting a community Pesach seder. 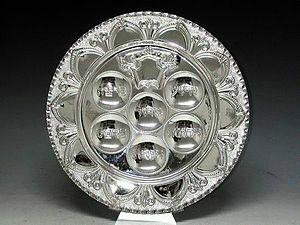 Our community seder this year will be on the first evening of Pesach, Friday, April 6. By popular demand, the Seder will again be catered by and held at Clark and Lewies restaurant in downtown Great Falls. Aaron Weissman will lead the seder. Details have not yet been finalized, but watch this page for specific times, prices and a reservation form! Posted on March 2, 2012, in Uncategorized and tagged Aitz Chaim, Passover, Passover Seder, Pesach. Bookmark the permalink. 2 Comments.